I love to swim, always have, so this is a bit of a selfish post because the second best thing to being in a pool on a 97-degree day is writing about them. Colorado is better known as a ski-state than a swim-state, but that doesn’t mean we don’t swim. In fact, at last check, we have more certified scuba divers here than anywhere else except Florida. 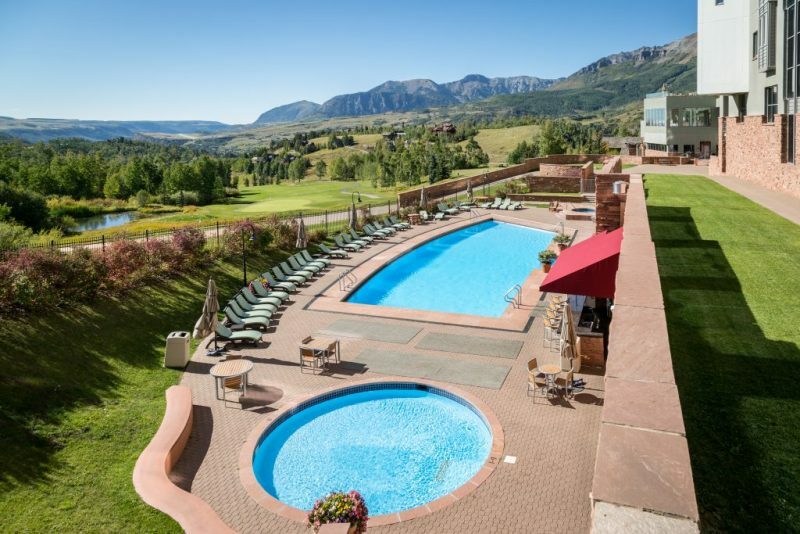 Coloradans love for the water means that Colorado’s mountain hotels have several wonderful hotel pools that are worth the stay just get your feet wet. 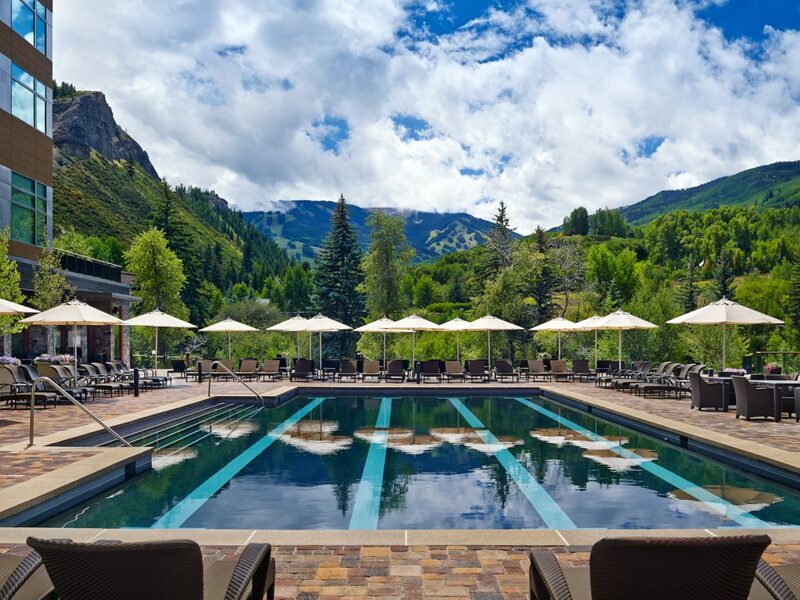 As you might expect, Vail has a number of good outdoor swimming pools including the riverside pool at The Antlers and the gorgeous inside and outside pools at Vail Spa. 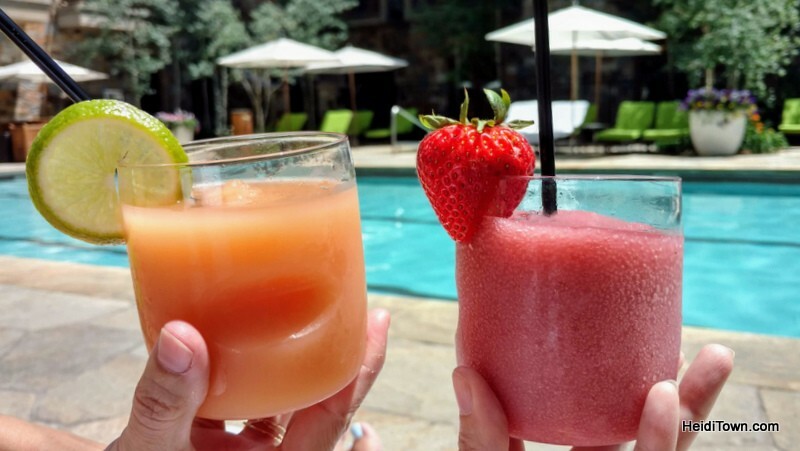 However, if you’re looking for a beautiful property and top-shelf poolside service, look no further than Four Seasons Vail. This is the type of hotel you never want to leave because you’re treated like royalty without having to be a stuffy royal. My point is that just because it’s fancy doesn’t mean it’s intimidating—after all, it’s in Vail and while high-class, the town is chill and laid back. 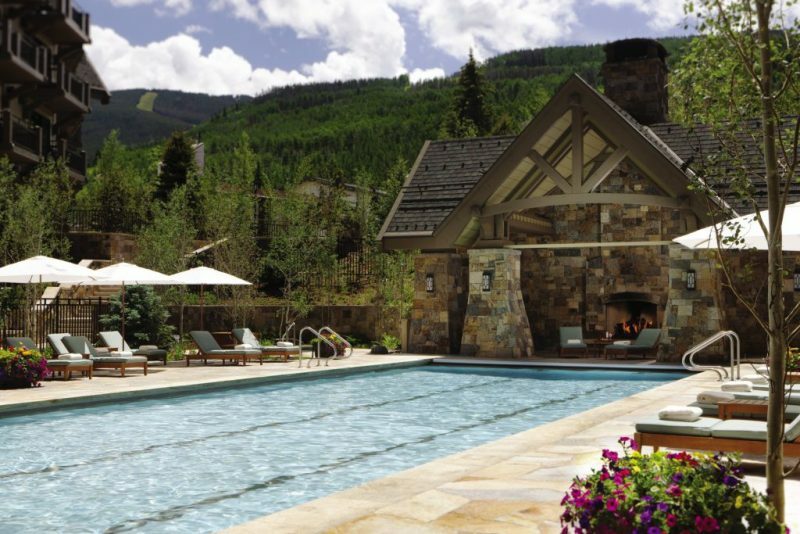 The pool area at the Four Seasons Vail includes a covered outdoor fireplace with seating, several hot tubs and lounge chairs with umbrellas. There are also private cabanas and tasteful landscaping. While there’s no mountain view here, the pool area has an exclusive and intimate ambiance. Pool attendants prepare your lounge chair with warm towels and quietly appear whenever their services are required. 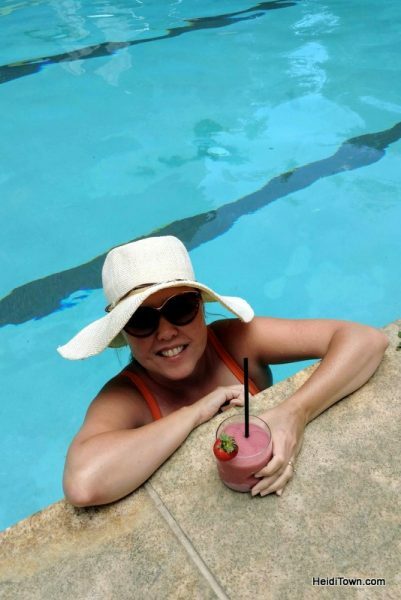 There’s a pool menu available featuring food and delicious drinks such as their fruity frozen cocktails. 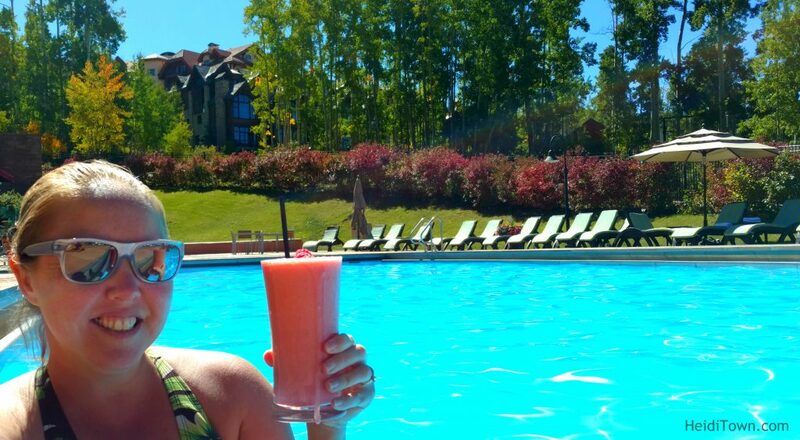 I’ve stayed at The Peaks on several occasions, both in the winter and summer and I have to say that their pool is an excellent reason to book a summer stay here. You won’t be able to take your eyes off the views from The Peaks and in fact, I highly recommend staying in a room with a view. The rooms that face west towards the golf course are simply amazing. I’ve taken a million sunset pictures from the balconies here. The pool area, just off the spa, faces west and enjoys the same expansive views, but you’ll need to take your eyes off the view to order from Deep End, the outdoor pool bar at The Peaks. Deep End is open from noon to 5 p.m. daily during the summer. Enjoying the pool before heading over the Telluride Blues & Brews. Don’t miss the Roman tubs in the spa area. The 42,000 square foot spa facility at The Peaks is Colorado’s largest and it’s quite an experience to spend a day here. Located in Mountain Village, either drive or take the free gondola into the Town of Telluride for the ultimate Telluride experience. I’ve stayed at this hotel a handful of times and their restaurant Maya has become one of my favorite Colorado mountain restaurants. Their pool, is also a favorite, although I’ve spent more time in their large riverfront infinity hot tubs. Everything is big in the Westin pool area; the view, the 25-yard lap pool, the hot tubs and the outdoor bar. Even the adjacent fitness area is huge and features a gorgeous yoga room. The Westin makes a great girls getaway hotel because the spa is also quite grand and one of the best the Rocky Mountains has to offer. You don’t have to take my word for it; locals treat themselves to this place on a regular basis. While this article is about summer pool time, the hot tubs at the Westin are our favorite spot on a cold winter morning. The pool area features an outdoor bar called Laps that’s open on weekends. They serve up great food including a scrumptious chicken quesadilla that I split with my mom during our trip. They also serve an array of drinks and cocktails. I know that there are other fabulous pools in the Rocky Mountains that I haven’t personally visited including the rooftop pool at The Little Nell in Aspen and the pool with a view at Garden of the Gods Collection. I’d love to hear about your favorites in the comments below. 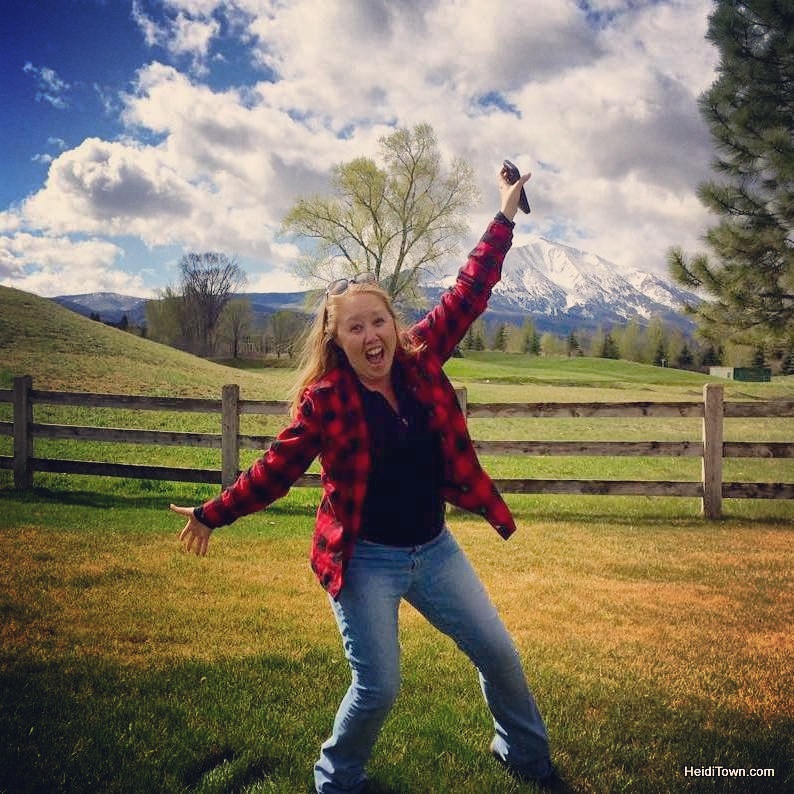 OHHHHHH This sounds like a weekend trip! Yes, I’d like to be heading out the door right now! Thanks for stopping by HeidiTown, Gail.